GOLDMAID breeding Champion and Grand Champion Welsh Springers since 1987. Goldmaid Breeding Australian Shepherds since 2013. Goldmaid have produced the Multiple Supreme Champions, Grand Champions and over 33 Australian Champions. 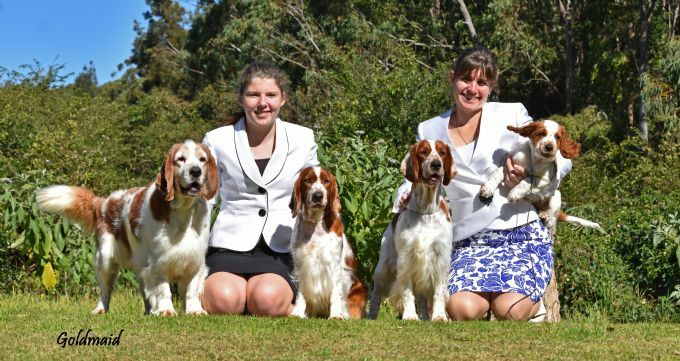 Goldmaid have breed the highest achieving Welsh Springer in Australia in the history of the breed in Australia - Supreme Champion Goldmaid Dangerous Player AI - "Dan"
All breeding stock hip & elbow scored and eye tested (including testing for HC & Gondiogensis). Please have a look at our site for individual dogs health details and contact us for any further information.